I have had a fairly adventurous life, but in particular, have undertaken five ‘major’ adventures in Japan. – Walked the length of Japan – 3200km in 99 days. In 1993, starting on my 31st birthday, I began walking from Sata-misaki (Cape Sata), the southernmost point of mainland Japan, and didn’t stop until I reached Soya-misaki (Cape Soya), the northernmost point of Hokkaido over three months later. I wore through four pairs of boots, which inspired the title for my first book, ‘Four Pairs of Boots’. – Hiked around the 88 Temples of Shikoku – 1400km. Two years later, in 1995, I set off around the legendary pilgrimage trail on Shikoku, Japan’s fourth largest island. Pilgrims (o-henro) have basically been walking the same route for over 1000 years following in the footsteps of the great Buddhist Saint Kobo-daishi, who achieved enlightenment on the island. I’m not sure how enlightened I am, but I certainly had some intriguing experiences, detailed in my second book, ‘Tales of a Summer Henro’. 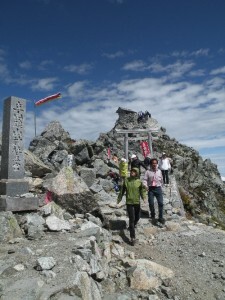 – Climbed Japan’s 100 Famous Mountains – in a record 78 days! In 1997, Travis Taiaroa and I set out to break the record for climbing Japan’s Hyakumeizan (the 100 Famous Mountains). 78 days later we had slashed the record by 45 days and put the New Zealand flag on the front page of the Japanese daily newspapers. We climbed in all conditions, ate bathed and slept whenever and where-ever we could, lost a lot of weight, and did a lot of laughing. 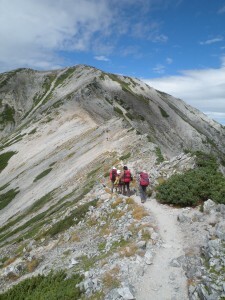 Read ‘Hyakumeizan – the 100 Mountain Challenge’ if you’re interested in our experiences along the way. – Walked across Japan from the Sea of Japan to the Pacific, climbing all Japan’s 3000m peaks along the way. David Joll joined me on this 27-day expedition in 1998 that took us from one coast to the other, up and over everything! I’ll never forget the look on one sponsor’s face at the start when Dave had to get his knee supporters out to use the ‘squat toilet’ before we set out. 27 days later that same sponsor had a smile on his face! Read my e-book ‘Japan: Coast to Coast‘ for the story.